Alongside the Vietnam War and the Cold War, the Korean War (25 June 1950 – 27 July 1953) is one of the major international conflicts that dominated the post-World War II period. 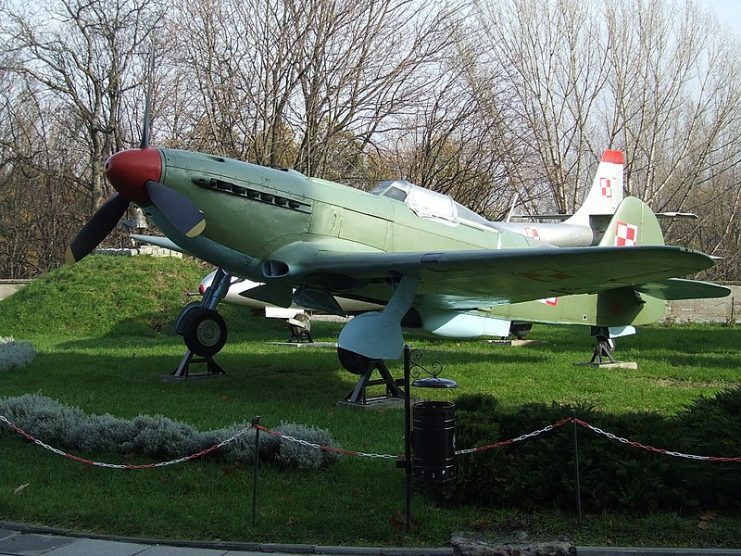 One peculiar aspect of these post-World War II conflicts was the many instances of aerial combat between the planes of the United States and those of the Soviet Union. Through a fierce three years of surging bloodshed between North Korea (assisted by China and the Soviet Union), and South Korea (assisted primarily by the United States) in a quest for a border-thrashing dominance over the whole of Korea, the Korean War saw a number of dogfights between the Soviet Union and the United States, with history’s first ever jet versus jet air battles taking place. North Korean Ilyushin Il-10 1950. 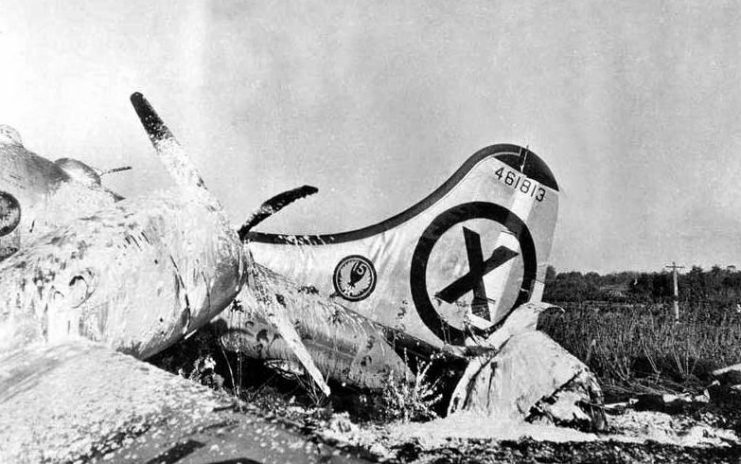 The battle for air supremacy in the Korean War ensued roughly on the 25th day of June, the first day of the war, and the campaign would become noteworthy in the history of the United States Air Force (USAF) as it would become the first war which involved the newly independent USAF. U.S. Air Force North American F-86 Sabre fighters from the 335th Figher Interceptor Squadron, 4th Fighter Group, in Korea in April 1952. During this period of aggressive aerial exchange, the most prominent jets from the USAF were the F-86 Sabre jets which locked horns with the highly sophisticated, outrageously quick Soviet-built MiG-15 jets. 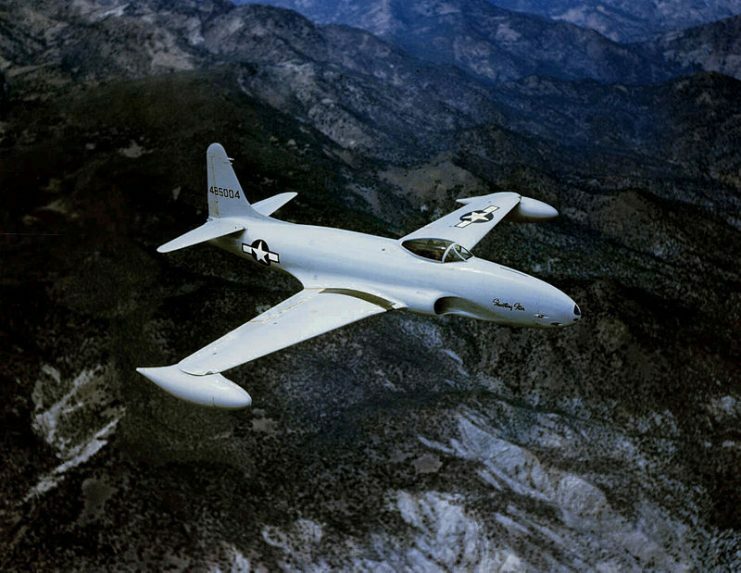 USAF Lockheed P-80 Shooting Star. 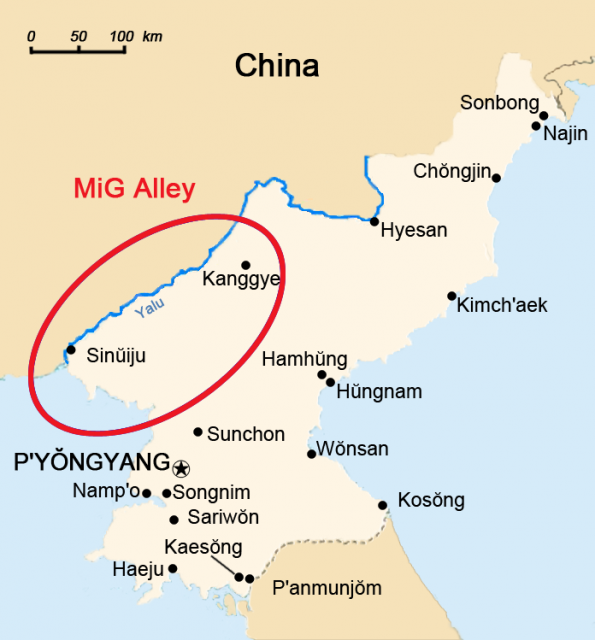 In the early days of the war, the North Korean People’s Air Force, with no anticipation of intervention from the United Nations, invaded the South Korean side, exerting superior air prowess over their South Korean neighbors, and consequently dominating South Korean skies while forcing a weaker South Korean military into retreat. In a bid to prevent the collapse of South Korea, the United Nations (with the US primarily involved) sent in military forces to their aid. 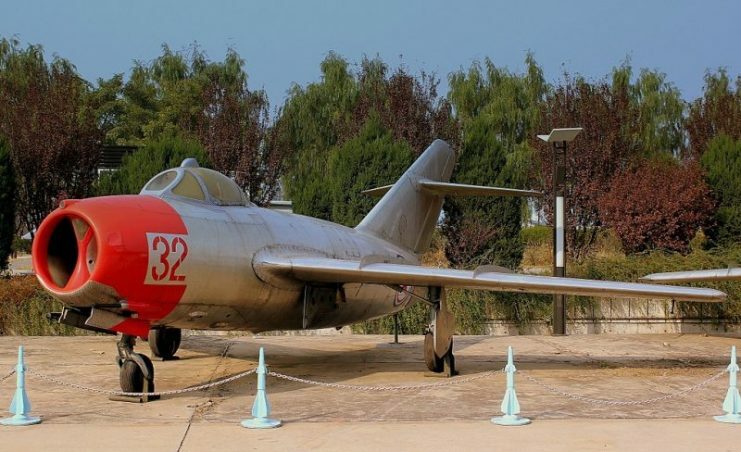 And so it went that on June 27th, 1950, the North Korean aircraft met with the US aircraft in what would become the first air combat of the Korean War—the Battle of Suwon Airfield—which pitched the USAF’s North American F-82 Twin Mustang and F-80C Shooting Star aircraft against North Korea’s Lavochkin La-7 and Ilyushin Il-10 aircraft. F-80 Shooting Stars of the 8th Fighter-Bomber Group Korea. This was easily in favor of the US as they had better pilots and superior jets. 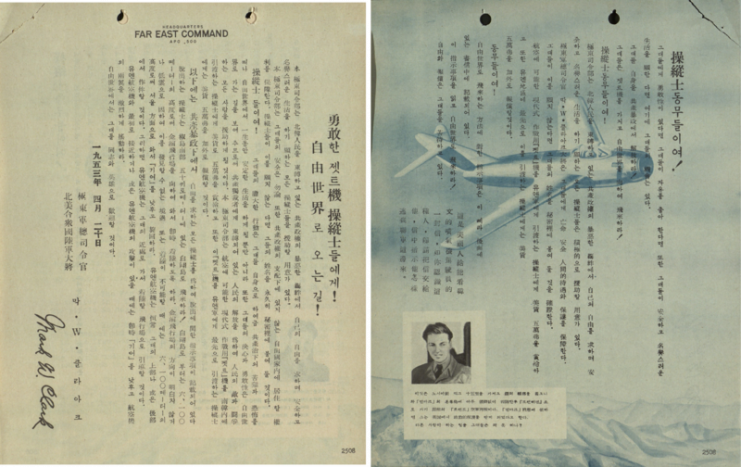 But everything would change on the 8th of November during a USAF attack on an airfield in Sinuiju. 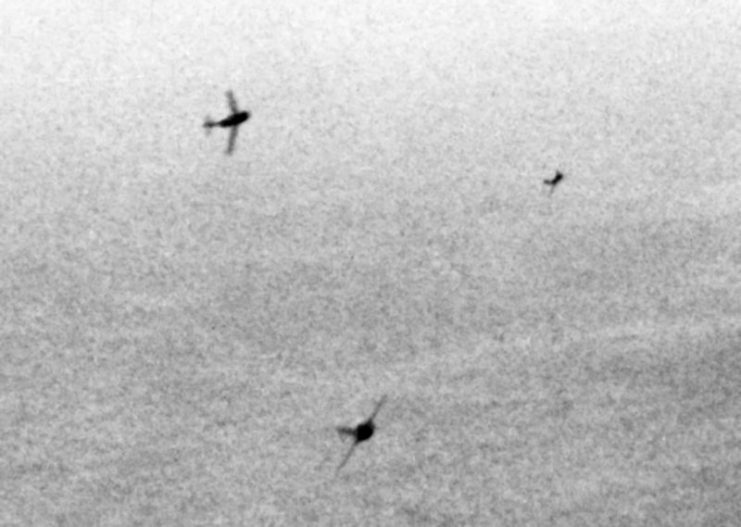 The moment several silvery glints appeared unannounced in the sky, rapidly increasing in size with their fierce approach, Lt. Russell Brown, on spotting these fierce jets, radioed to abort their attack run: the MiG-15 had joined the party. 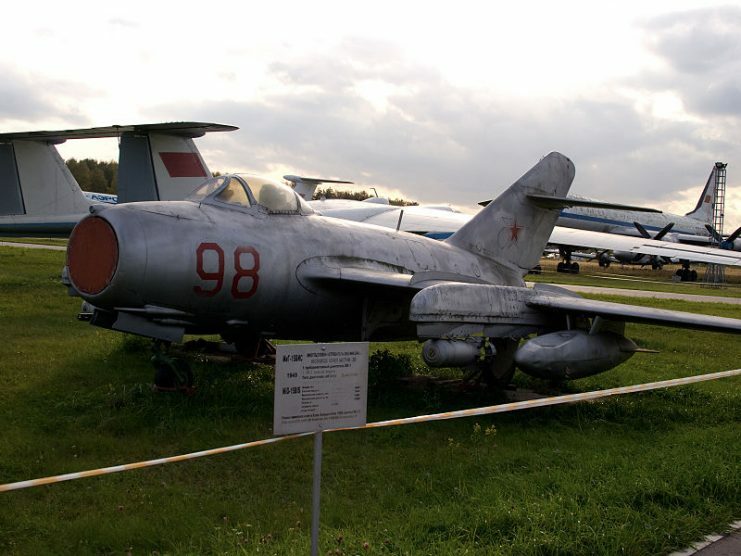 The Mikoyan-Gurevich MiG-15 was a sleek fighter with highly advanced technology, unmatched by the technology of the USAF aircraft. It was among the earliest of the swept-winged fighters to achieve high transonic speed. 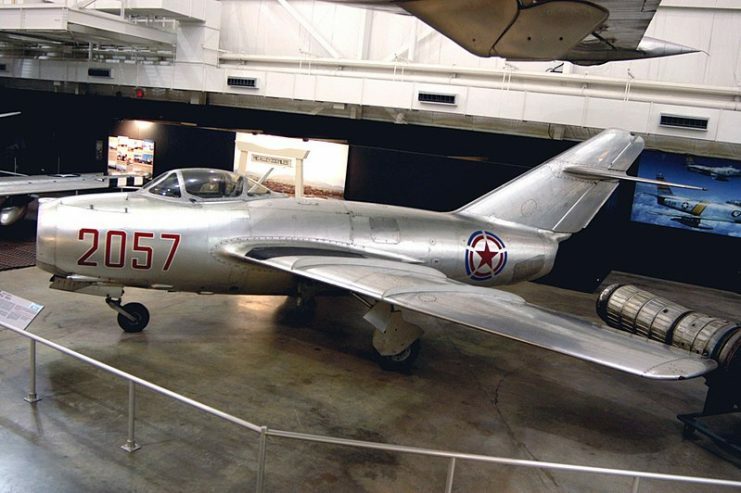 MiG 15 at the National Museum of the U.S. Air Force. It was a symbol of dread for the USAF, slashing through formations and hampering the US bomber fleet. The F-86 Sabre jets were designed as a direct response to the MiG-15 which was causing havoc in the Korean skies. Flown by WW2 veterans, it battled the Soviet aircraft in the engagements that defined the Korean War’s air combat. Navy F9F Panther Shooting down a MiG 15 in North Korea. The USAF recorded victory, thanks to the dexterous tactics of the pilots and the prowess of the Sabres. Alongside the Sabres, the USAF fielded several other types of aircraft to combat the Soviets, as a matter of fact, the Sabres had come at a later time into the war and would not have been needed if the MiG-15 aircraft had not shown up in the skies, bringing terror along with it. These aircraft were very instrumental in the Korean War in as much as they had some shortcomings, they were the unsung heroes of the air, for many of which the Korean War was their last. The North American F-82 Twin Mustang and F-80C Shooting Star aircraft opened the aerial combat during the Battle of Suwon, shielding the airfield from the onslaught of the invading North Korean flyers. They destroyed a total of 13 enemy jets on the first attack. 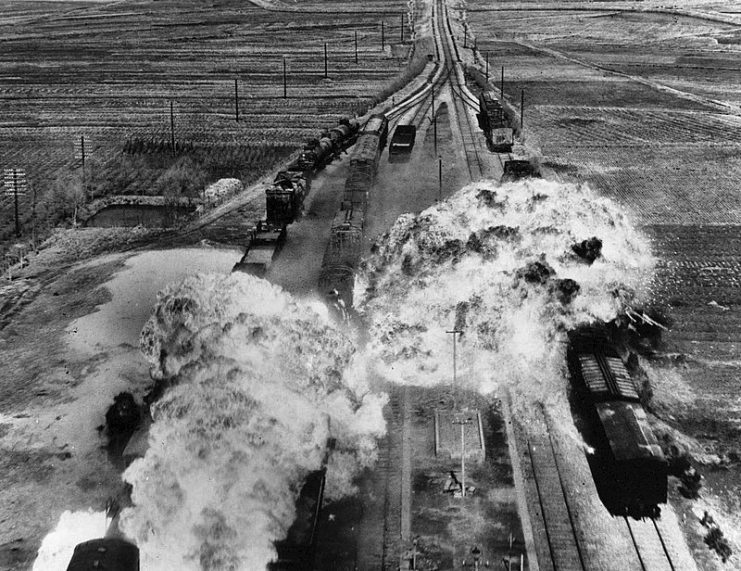 USAF attack on railroad in North Korea. While the F-82 Twin Mustang destroyed a total of 20 enemy jets—16 on the ground and 4 in the air—the F-80 Shooting Star was particularly involved in the first jet versus jet dogfight in war history, during which it added the MiG-15 to its list of downed enemy jets. 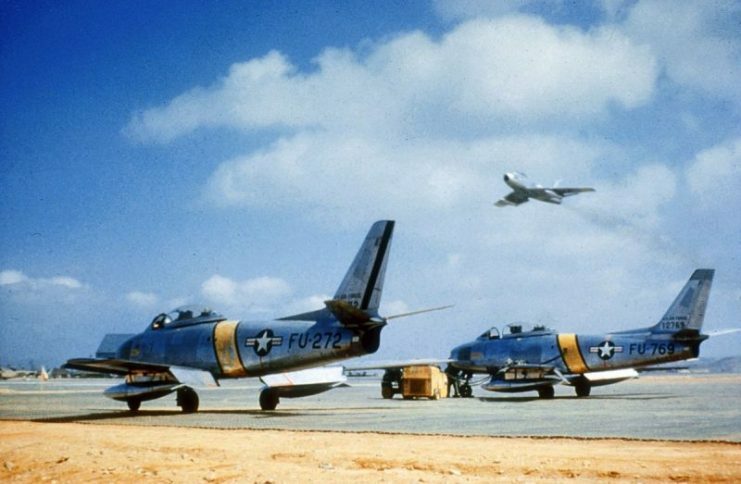 F-94B’s of the 4th Interceptor Squadron. 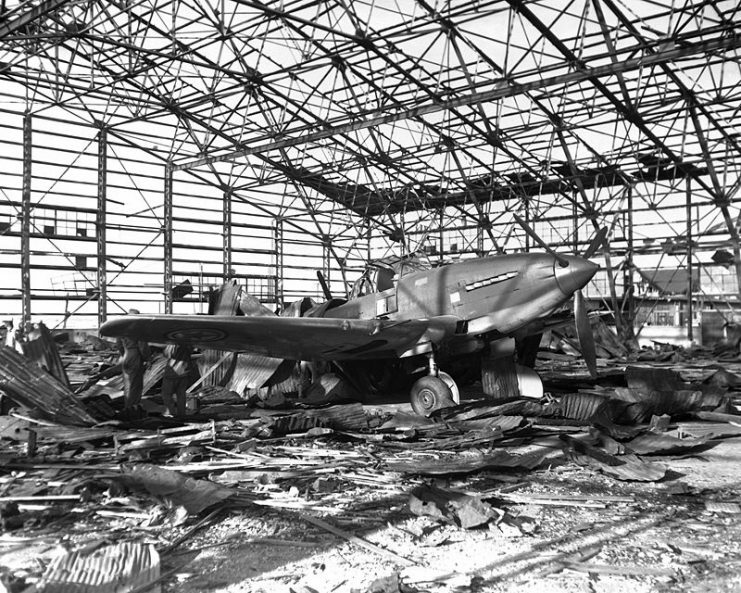 Before the end of the war, the Twin Mustang would be withdrawn from combat, to be replaced by the F-94 Starfire, due to a shortage of spare parts. The North American FD-51 Mustang played its part in pushing back the invading North Koreans while downing a few Yaks. B-29 Superfortress during Korean War. 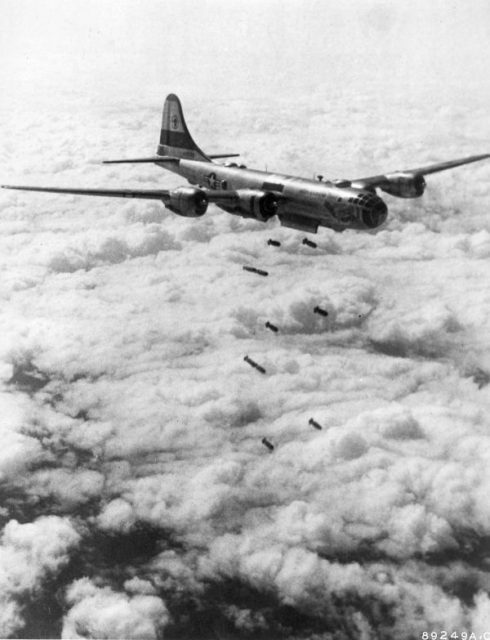 The Boeing B-29 Superfortress and the Douglas B-26 Invader were two of the bombers employed by the USAF during the war. 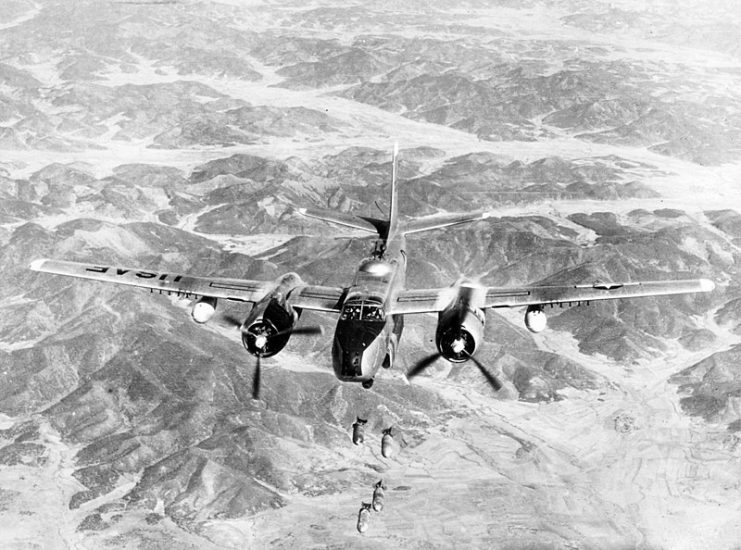 The B-26 registered its first attack against North Korea on 29th June 1950, when they bombed the main airfield of North Korea, Pyongyang Airbase. Reconnaissance B-29 Shot Down by MiG 15’s near Yalu River 1950. Both of these bombers were used as reconnaissance as well, with the Boeing B-29 labeled as RB-29 and the Douglas B-26 Invader as RB -26. The RF 51-D Mustang was among the first Mustangs to be hunted by MiG-15s, but the adept flying skills of the pilots enabled them to avoid damage; these pilots were indeed veterans of WWII and full of combat experience.